I purchased an antique sunburst mirror years ago; I like to think it was before the current rage for sunburst mirrors became so pervasive. I am thinking about buying another sunburst mirror to put above my new headboard (being made right now). 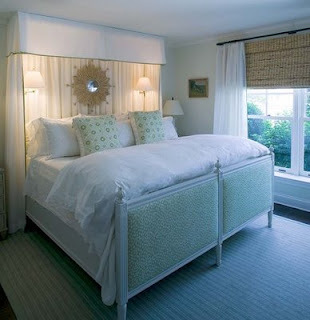 Perhaps this is trendy, but I love the look of a round mirror above the bed. After going through my bedroom inspiration files, I found so many pictures of this look that I can't imagine doing anything else! Here is a picture from my favorite store in Atlanta, Mrs. Howard. 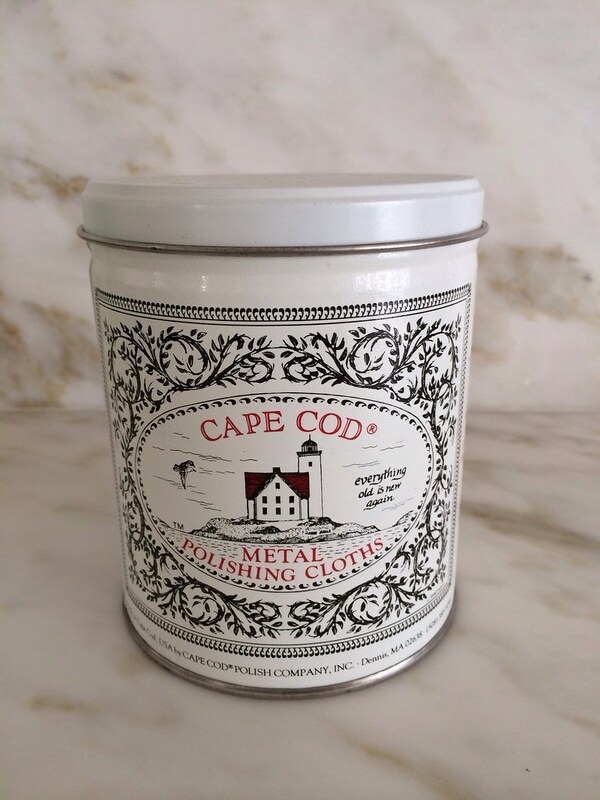 The whole store is set up like a home - each room has its own vignette - and everything is available for purchase. Photography is not allowed, but this picture was on an e-mail from the store. Although not a sunburst mirror, a round mirror has the same effect. 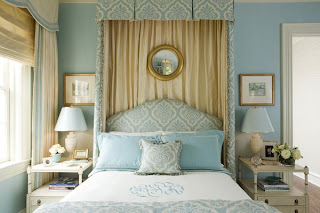 Interior design by Kelley Proxmire. 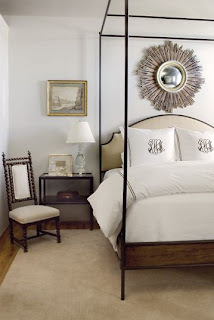 Another round mirror above a bed, in the home of Pieces owner Lee Kleinhelter. I think this mirror is a bit small, but I still like the look. From an Atlanta real estate listing. 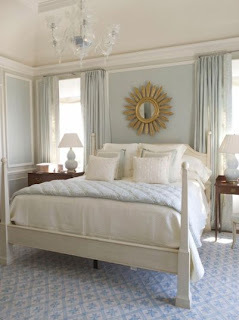 Suzanne Kasler has a sunburst mirror above her own bed. From Atlanta Homes and Lifestyles. 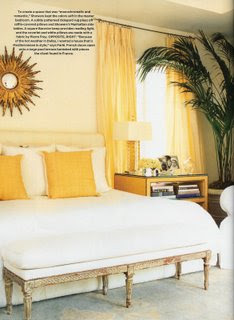 Jan Showers used an antique sunburst mirror above this bed, from Western Interiors Magazine. 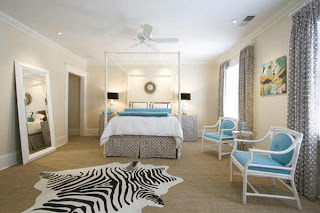 A small sunburst mirror abve a four poster bed, from an Atlanta real estate listing. This room, designed by Phoebe and Jim Howard, was in a showhouse last year. An all glass sunburst mirror was used in this design. Another room by Phoebe Howard - clearly she likes the sunburst above the bed motif! I like the scale of this mirror. 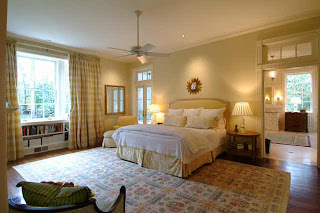 Carole Weaks did the interiors of the master bedroom in the Atlanta Symphony Showhouse 2008. She used a large round mirror and artwork above the bed. 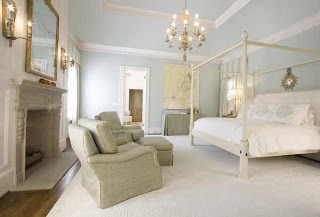 One of my all time favorite bedrooms, from an Atlanta real estate listing. The sunburst mirror is part of the charm! The cover of Atlanta Homes and Lifestyles, from an issue last year. 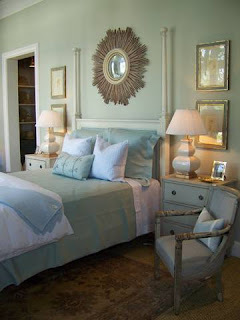 I love the blue and white bed, and although the mirror is a bit spiky for my taste, I still like to overall look. Another room by Phoebe Howard. This looks like the Julian Chichester sunburst to me. Here is mirror is placed between two twin beds. Yet another Phoebe Howard design. After I did this post, the Material Girls found another beautiful image from Phoebe Howard's portfolio. How did I miss this one? It is beautiful. Phoebe Howard creates the most magnificent bedrooms. This is the sunburst mirror that has caught my eye. This is from a room done by David Netto (found via My Notting Hill). a custom furniture company out of Los Angeles. I think this is such a beautiful variation of a sunburst mirror, very soft and feminine. I think the mirror you chose is beautiful. Placing it above your bed would look lovely, just as it does in all of the great images you just shared. 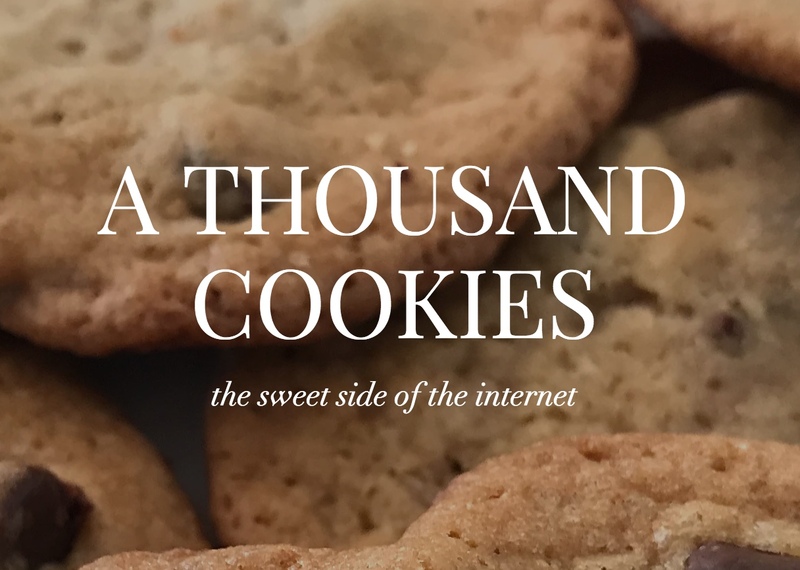 Thank you so much for your comment on my post on dream kitchens. Good luck with yours! 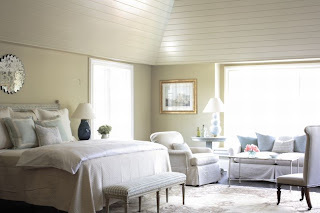 Lovely post... all the rooms are very pretty! Mirrors are great! 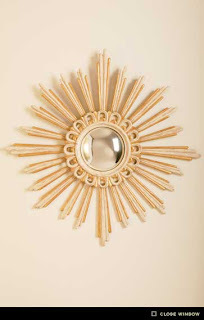 love a sunburst mirror- have one above my bed and another in my entry hall! btw, congratulations- you are now an award winning blogger! I have have lovely round morror I aquired about ten years ago from Ballard Design and just love it! How do I send you an image? I love the mirror that you found. The soft gold is divine. My goodness, so much inspiration! I love all the Atlanta homes. The mirror you chose is lovely - a perfect choice for right over the bed. I always think that is such a tough spot to decorate. Okay, I am officially obsessed with the Howards! Thanks for all the beautiful pictures...very inspiring! I am glad so many are enjoying Phoebe Howard's website. 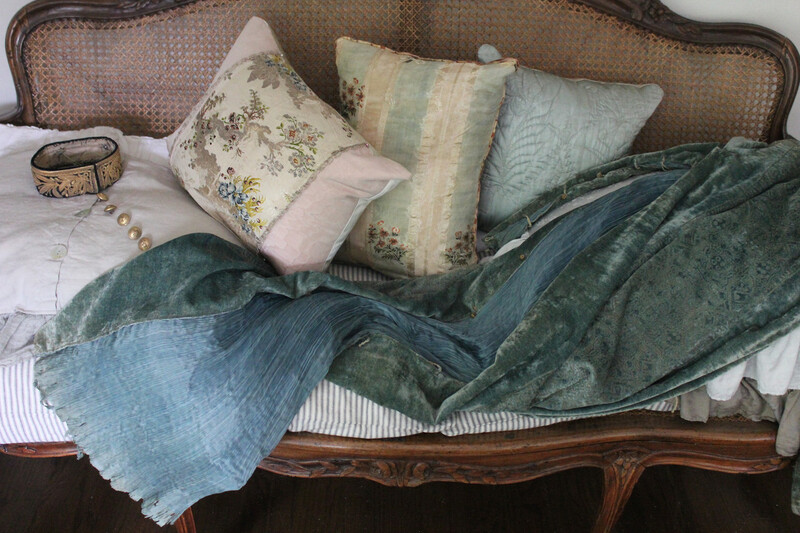 Her designs are featured on the cover of the July/August Southern Accents. 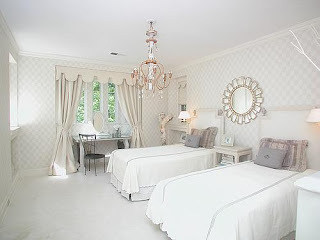 What beautiful rooms all of these are! Thanks for stopping by to see me, the Market sure was fun, if tiring. I'd love to go back again & take it all in. We have a round mirror over our bed, too -- a vintage mosaic mirror we found at the flea market. What I really want is a round mirror suspended from a leather strap, kind of like a giant pocket watch. 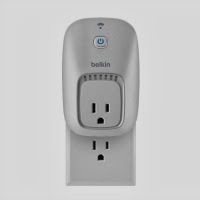 Anyone know where to find one of those? Leah - yes, I know what you mean about sunbursts being played out, but I still love them above a bed! Have you seen the round mirror from Suzanne Kasler's new collection for Hickory Chair? I like it. Wow, what a lovely post. You have some stunning pictures of sunburst mirrors - very inspirational. Thanks for the nice comment on our blog. Tracey. I put one over my bed a few months ago and it changed the whole look of the room - i love the one you picked out - beautiful pictures. Love, love the photos. Alot of times as an interior designer and fellow blogger we all see the same pics over and over again - but not with this post. You've found some unique finds! 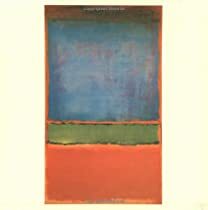 I have some truly great pieces on there that are very affordable and the pickings run the gamut from modern to European. Please stop by! * Pretty, prettttty spaces!!!! Thank you!! !